Bay Area is home to a teeming Indian community. A quarter-million people of Indian origin live in Fremont, Sunnnyvale, San Jose, Santa Clara and surrounding areas. Indians are the backbone of both established IT firms (like Google and Facebook) and dozens of startups in Silicon Valley. The Indian community in Bay Area is so large that mainstream American cinema houses like AMC Mercado 20 in Santa Clara, Century Union City Union City screen Hindi movies every week. Two Indian cinema houses in Fremont and San Jose (Big Cinemas) screen new Telugu, Tamil and Hindi movie. Whether it is Hindi film Zero or any other Indian movie you can be sure it will release in Bay Area on the same date as India. Bay Area is home to countless curry houses. Whether you crave South Indian Pongal, Hyderabad Dum Biryani, North Indian Tandoori Chicken, Punjabi Kadi, Gujarati Dokhla, or Bombay Chaat, you can have 'em all and more at Bay Area Indian restaurants. Several Hindu temples have come up in the Bay Area to cater to these devout, hardworking souls. Shiva-Vishnu Temple in Livermore is a landmark for all Hindus in the Bay Area. Since its consecration in 1986, the Shiva-Vishnu Temple has evolved into a beacon for the Hindu community. Shiva-Vishnu Temple is open on weekdays from 9AM - 12PM and 6PM - 8PM and weekends and holidays from 9AM - 8PM. Other Hindu temples in Bay Area include San Jose Lakshmi Ganapati temple, Sunnyvale Balaji temple, Sunnyvale Hindu temple, Fremont Hindu temple, Jain temple in Milipitas and Shiva Murugan temple in Concord. Please visit the Hindu temples section to see more Hindu temple pictures and timings. Bay Area Gurdwaras and Indian Churches cater to the spiritual needs of immigrants from diverse corners of India. 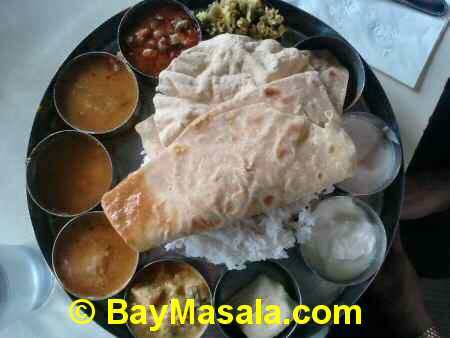 Featuring Hindi movie showtimes, Indian restaurant reviews, attorneys, travel agents, Hindu temples, Wedding Mandaps, Hindu Priests, Photographers and more, BayMasala.com is a valuable resource for the Indian community in Bay Area.